The Barcelona Card is the ultimate City Card: save money and time with free use of public transport, free admission, lots of discounts and admission to sights without standing in line. If you want to get to know Barcelona on your own, the Barcelona Card is ideal. It is one of the most booked tourist services in Barcelona. Delivery via e-mail (voucher) and via post. 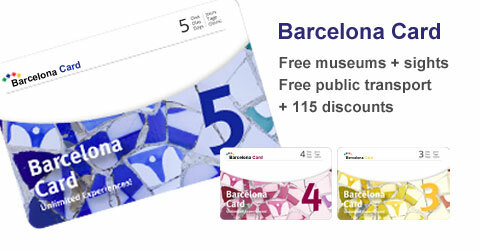 The Barcelona Card offers many top attractions with free and discounted admission, no standing in line, free use of public transport and much more. The Barcelona Card is available for 3, 4 or 5 days (72, 96 and 120 hours from first use). For 2 days (48 hours) you can get the Barcelona Card Express. Simply specify the desired number of Barcelona Cards / Barcelona Cards Express and select the shipping method. You have the choice between postal and e-mail delivery (voucher). Full flexibility: You can decide yourself from when you would like to use the Barcelona Cards in the respective year of validity. You do not have to commit to a specific date when ordering. The beginning of validity is the first use of the card. The Barcelona Card is valid for 72, 96 or 120 hours. The included public transport ticket is also valid for 72, 96 or 120 hours from the first use. Fast mailing (4.90 € shipping costs): This allows you to hold your Barcelona Cards in your hands before you travel. No waiting at pickup location required, no detours. You are independent of the opening hours of the issuing offices. Here you will find an overview of the delivery times. Sending by e-mail (free shipping): Immediately after booking, you will receive a voucher that allows you to pick up your booked Barcelona Cards directly at the airport or at various points in the city (for delivery points see below). With the Barcelona Card you will receive a booklet with a description of the benefits and a city map and metro plan so that you can easily find your way around. The Barcelona Card Express offers a folding map with the sights and venues for which you can get a discount. Here you can download a PDF document with all benefits included in the Barcelona Card und Barcelona Card Express. Free and unlimited usage of public transport: TMB buses, metro, FGC trains, trams, Renfe Rodalies trains in Zone 1. The included public transport ticket is valid for 3, 4 or 5 days (72, 96 and 120 hours from first use), the Barcelona Card Express for 2 days (48 hours). For example, if you use the 3-day ticket for the first time on Monday at 15:00, then Thursday it expires at 14:59. With the Barcelona Card you have free admission to 25 sights. At museums with skip the line you can just put the Barcelona Card on the scanner and enter the building. No waiting time at the box office! You receive discounts up to 60% at more than 70 attractions, such as sights, guided tours and sightseeing tours. You can get the discount right at the box office. You receive the discounts for the tours included in the Barcelona Card right at the box oddices and event venues. At events you receive the discounts depending on availability right at the box offices. It is recommended to book the ticket in advance on sight, for example a day prior to the event. You can get the Night Card at the Tourist Infos. With it you receive free admission (until 2:00) at 27 clubs in Barcelona. You will receive the discounts for the other services at the box offices or at the respective event venues. All information without guarantee. Subject to change. The 5-day Barcelona Card costs 57,00 €, so 11,40 EUR per day. Even with just one saved admission fee per day, the Barcelona Card can be worth buying. If you still use the metro from time to time and transfer to the airport by metro L9, you will save a lot of money. You do not need to worry about tickets. You save a lot of time with the included free admission with skip the line. The City Card for 48 hours, ideal for a short trip to Barcelona. Connect the Catalonian lifestyle with delicious food during this tour through the best tapas bars. Guided tour with a lot of fun: you will come far with the easy to operate segway. Experience the underwater world of the Mediterranean. In the glass tunnel through the shark tank. Tickets here.